These skills are highlighted at many sites including the Partnership for 21st Century Learning. So where does the library fit in? Many people still consider libraries to be quiet places for independent study, research, and a location to find a wide arrangement of materials in print form. This is where the Learning Commons comes into play. All Boards and Districts should remember to include their school libraries in their plans for becoming a 21st Century Learning/Teaching District. 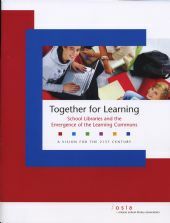 The Ontario Library Association has produced an excellent resource "Together for Learning - School Libraries and the Emergence of the Learning Commons" as a resource for re-inventing the school library for the 21st Century. Click here to review the document. Here is a link to a brief presentation that outlines our Board's plan to transition our school libraries to Learning Commons over the next three years. 6. Expand the use of the space for many activities including Author presentations, art exhibits, slam poetry, tech support, musical sessions, etc. Our first three transitions have been very effective - thanks to the dedicated library staff at the first three schools. 78 schools to go! I had the experience of transforming the library into a Commons at the last school that I was at...what a huge difference! Students reacted to the change by collaborating, discussing and LEARNING! Definitely a step in the right direction...thanks for sharing your post. Thanks Derek - thanks for sharing your comments - I'm enjoying your tweets as well! I guess let's just try to capitalize on any benefits that it will bring and demand that they give us neighbors something huge as a compromise. Thomas D'Amico - I am a Superintendent of Student Success - Learning Technologies with the Ottawa Catholic School Board. I view technology as a tool to help support effective teacher practice that impacts student engagement and results in student achievement.